First, please know that I am not a dog hater – in fact, a couple of years ago we lost Mei-Li, our much-loved 13-year old Shih Tzu. However, I may be in the minority among Tredyffrin residents, who do not support the idea of off-leash dogs in public places – unless they are in a fenced pet area. As background, when I was around two or three years old, my mother was taking me for a walk in the neighborhood. There were sidewalks and she was holding my hand when all of a sudden, an excited dog (probably just a large puppy that seemed enormous to a toddler) raced across the yard, knocking me to the ground and then standing over me like a prized trophy. The neighbor probably thought the incident amusing and just the actions of a playful puppy but I can still recall my terrified, helpless feeling all these many years later. Although not physically hurt by this childhood event; I remain easily frightened by large dogs. I enjoy walking on the Chester Valley Trail in Tredyffrin Township nearly every day year-round but in the last couple of weeks, I have had two encounters that have me writing this post – off leash dogs. In both instances, the owners had large dogs on the trail without leashes. We were walking in opposing directions and as I got closer, the dogs left their owners’ side and came running towards me. I was petrified and visibly afraid as the dogs jumped at me. In neither case did the owners apologize or even bother to leash their dogs – in fact, one owner commented, “Guess you don’t like dogs”. The fact that dog owners are on the Chester Valley Trail with their dogs off leash had my thinking about Tredyffrin Township’s “off-leash ordinance” for dogs at Teegarden Park passed last fall. So this week, I drove to Teegarden Park around 2 PM and remained at all times on the large asphalt parking lot. 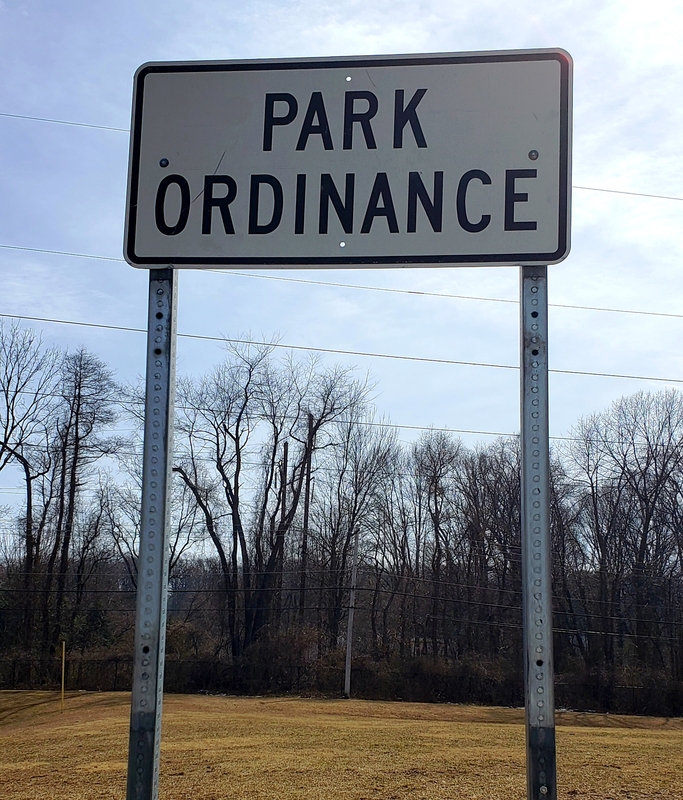 I noticed that the park ordinance sign was missing – perhaps, it is being updated with the new ordinance regulations. There was a separate small sign posted by the ‘Friends of Teegarden Park’ in the park message board which addressed the off-lease policy for dogs. For about 30 minutes, I watched the off-leash dogs and their owners. Up on the slight incline there were six or seven men standing together with eight or nine dogs running all around, most often in groups of two or three. Three different large dogs at various times left the field and raced down to me in the parking lot, barking and jumping. Although many supporters of off-leash at Teegarden tout, “Off Leash and Under Control”, that was not my experience as I stood in the parking lot. At no time, did any of the dog owners come to the parking lot to get their dogs or call them. Having an unleashed dog rush unwanted and uninvited is a stressful event. I yelled to one dog owner that I was afraid of large dogs (as the animal circled and jumped on me from behind) and his response was “Don’t worry, my dog is very friendly – and will only lick you to death”. Please know that off-leash dogs can be intimidating. But It was the third time that a dog came running down to the parking lot that was the scariest. An older woman had driven in to Teegarden Park and had an infant in a carriage and a 3 year old little boy. Turns out she was the babysitter and had no dogs. As we stood in the parking lot, discussing whether it was safe for her to take the children to the park playground because of the off-leash dogs, down the incline comes running a very large black dog (without a collar). The dog jumps at the baby carriage, frightening the children. I (who am terrified of big dogs) start yelling trying to distract the dog from the children and to alert the dog owner. Again, the dog owner never comes down to the parking lot and here is the babysitter, myself and two children with a dog barking and running loops around us. Eventually the dog bored of the activity in the parking lot and returned to the other dogs up on the hill. Although I am sure that the owner would say that the dog was just friendly, it was scary nonetheless. The parks in Tredyffrin Township are to be enjoyed by all of its residents, including Teegarden Park. In my opinion, the newly approved off-leash ordinance at Teegarden Park is difficult, if not impossible to manage and enforce. Dog owners are required to file an off-leash application with fee (Residents $25/dog; Non-Residents $50/dog). Who is responsible for making sure the dog owners have an application on file (which requires veterinary information, dogs license and vaccination records at registration) and paid annual fee. Off-leash dogs are required to wear registration tags – yet I saw at least one dog at Teegarden Park without a collar. As an aside, is there no concern that registered off-leash dogs at Teegarden may be in contact with unlicensed or un-vaccinated dogs? Where does the annual revenue for Teegarden Park off-leash registration go? Although Mill Park (in the western section of Tredyffrin Township) does not have an off-leash ordinance, dog owners routinely let their dogs run at this township park without leashes. In fact, rather than pay the $25 annual fee to legally have their dogs off-leash at Teegarden Park, some residents who oppose the fee have said they will now use Mill Park. Tredyffrin Township leash law “requires that you pick up after your dog. Allowing your dog to defecate and not removing the waste carries a fine of up to $1,000.” And although the Friends of Teegarden post that dog owners are to “pick up and remove dog waste”; I observed during my short visit that three dog owners did not pick up/remove the dog waste. Who will enforce? With baseball season soon to begin at Teegarden, who will be responsible for maintaining the fields? According to the Friends of Teegarden sign, dog owners are to keep their animals “out of fenced areas” yet I watched two dogs running around inside the fenced tennis courts at Teegarden Park. In addition, the sign states that dogs “must be under voice control”. For this to work, dog owners need to actually watch their off-leash dogs. Remember on my short visit, three different dogs left the fields, parking and jumping at myself and other visitors in the parking lot. Also, it should be added that a car narrowly missed hitting one of the dogs in the parking lot. At no time, did the dog owners call or retrieve their animals from the parking lot. In my opinion, the off-leash situation at Teegarden Park is serious and an accident waiting to happen. 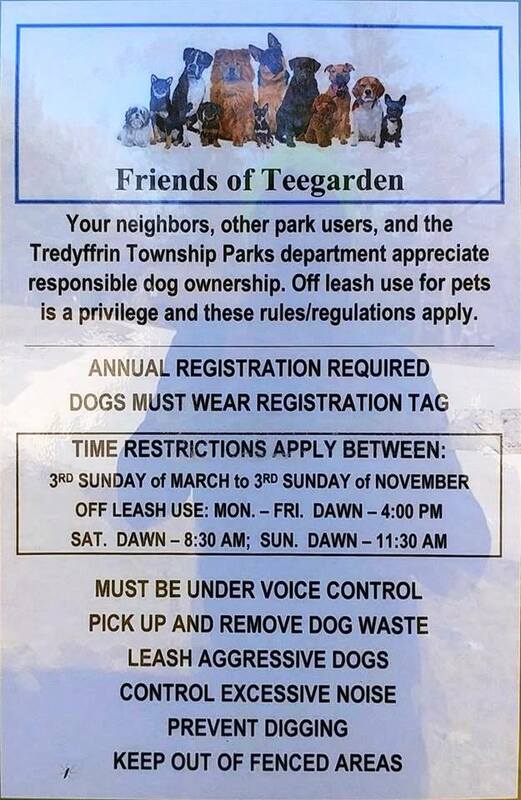 If you review the township off-leash application form, dog owners must agree to hold Tredyffrin Township harmless from any claim of loss or injury, etc. but where does that leave the residents (without an off-leash dog) who venture to Teegarden Park? In my opinion, you visit Teegarden Park (and apparently also Mill Park) at your own risk.